Hello my loyal followers. In my last post I introduced you to the #Blazerof2016 challenge. Well I am pleased to see so many people taking up the challenge and having a go at sewing some menswear. If you haven’t yet plucked up courage to take part you still have plenty of time. Details are here. I have made a start with my #Blazerof2016 and after a lot of procrastination picked the fabric. A medium-weight cotton/wool blend. Now before I show you my progress I wanted to have a little chat about ‘Hand Sewing’. “Why sew by hand?” I hear you cry. Well lets be honest….You won’t really be able to sew clothing properly without a little bit of hand sewing. 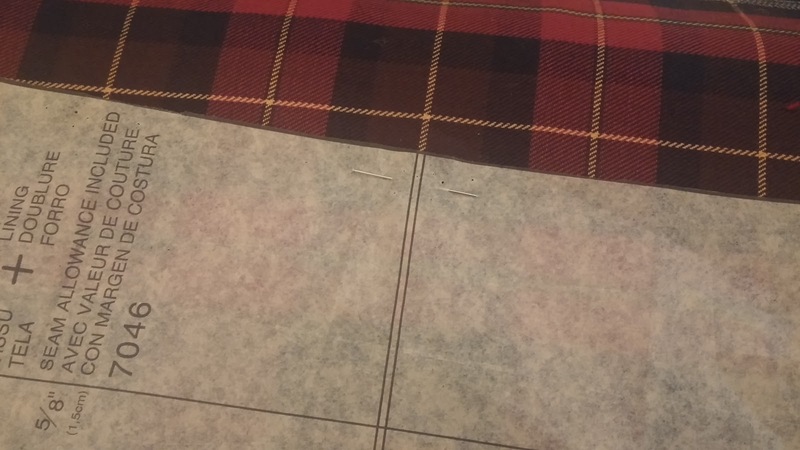 I think it is often over-looked and, I myself, was guilty of skipping the ‘sew-by-hand’ part in many pattern instructions when I started sewing. I used to try and do everything by machine, alas not very successfully! For those of you taking the #Blazerof2016 challenge, this may get you thinking about how much you sew by hand; as sewing a more ‘tailored’ item certainly calls for more hand sewing. I’ll start with a few of the most basic but important hand stitches you should know that I have used for the first stage of my #Blazerof2016 challenge. 1. The Basting stitch. You will not find many patterns that don’t ask you to ‘Baste’ at some point during construction and this has to be the one stitch that most people omit: Yes basting takes time but it will certainly save you time in the long run. The basting stitch is a temporary ‘building’ stitch to join 2 or more pieces of fabric together before sewing permanently. After permanent sewing the basting stitch can be simply pulled out of the fabric. In fact the word ‘Baste’ comes from the word ‘Bastir’ meaning ‘to build’. Basting is particularly important to hold fabric together when sewing complex shapes such as curved seams. The basting stitch is a simple ‘running’ stitch and can be equal or unequal. 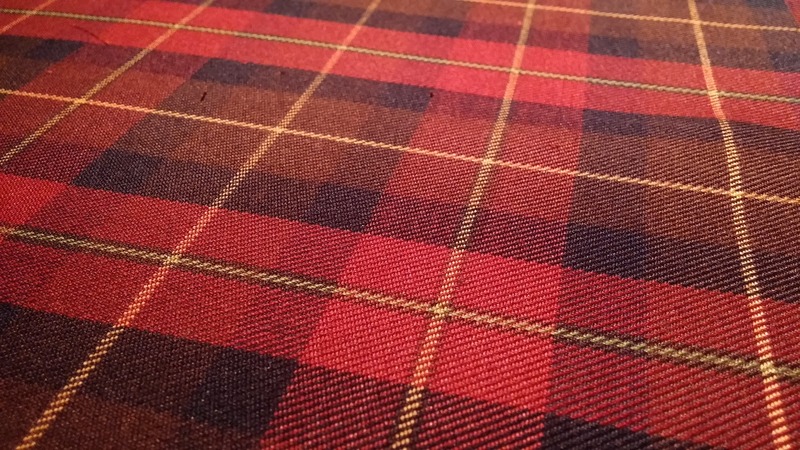 In the equal stitch the length of stitch and gap between each stitch are the same size (roughly a quarter of an inch) and allows for good control when holding the fabrics together; especially curved seams, when setting in sleeves and attaching collars. The unequal basting stitch is made by taking short stitches through the fabric (same as above) then leaving a much larger gap before taking the next stitch. The method offers less fabric control than the equal basting stitch but is good for holding less complex fabric shapes together or to just keep things in place. This photo show the equal stitch with the unequal stitch below for comparison. The full backstitch is created in exactly the same manner as the previous stitch except you stitch back the full length of the gap. In other words start the next stitch at the end of the previous stitch then come back through at double the distance. The completed full backstitch (when done well) can look like machine stitches. So back to my #Blazerof2016 make. 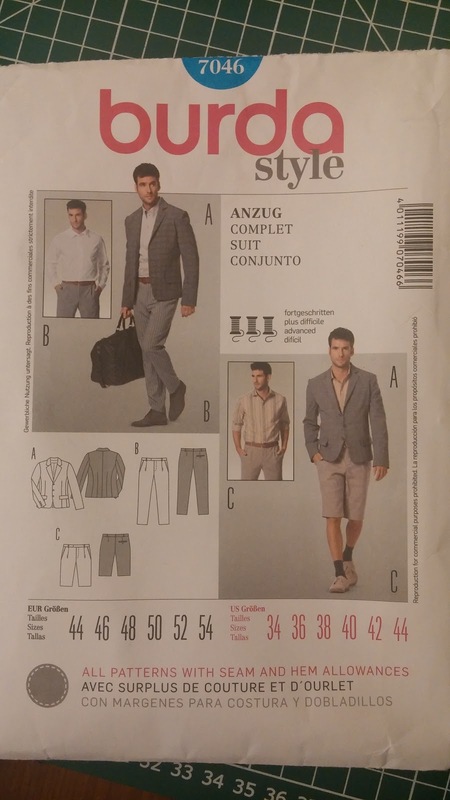 I decided to use the Burda 7046 pattern for this challenge as it is a nicely shaped, slim fit jacket. 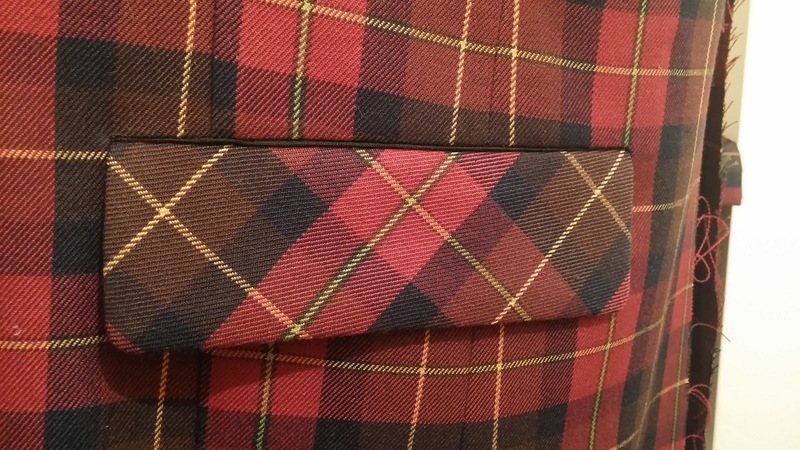 Now I know some of you will be wondering about pattern matching with the fabric I chose… I decided to ensure that horizontally the pattern matched by using the centre most shorten/lengthen line printed on the pattern. This line was placed along a yellow stripe. The grainline marking on the pattern was placed along a green stripe. Now the other problem is that we often cut pieces with the fabric folded. Making sure the pattern matches on the folded fabric is a nightmare so I cut each piece individually. (just remember to flip each pattern piece over after cutting the first piece!) Yes it did take longer but I could be assured the pattern on each piece was identically placed. The next step is a little bit of iron work. What am I talking about? Iron-working is the process of stretching and shrinking your pattern pieces (using an iron!) to get some shape. 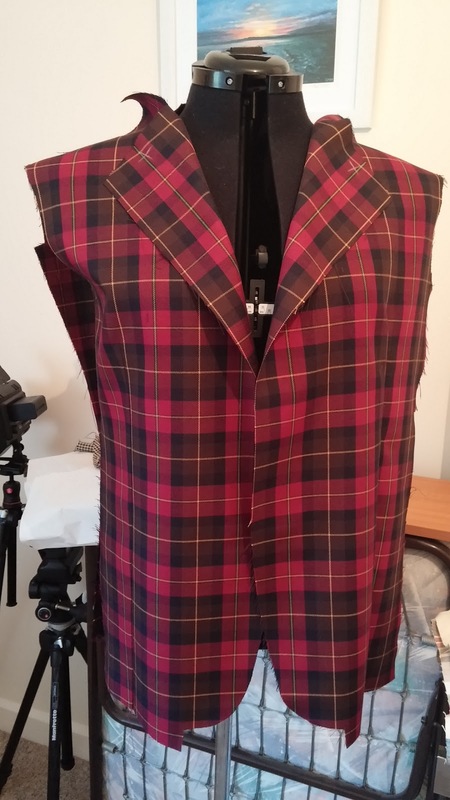 Unlike womenswear, that has a myriad of darts and shaped seams, menswear is a little more ‘boxy’ Yep get the iron out and start shaping the pattern pieces before sewing them together. This might be something new to you but is well worth having a go and with practice it’ll become second nature. This is how I generally iron-work a jacket. To shrink use lots of steam, little pressure and move the iron around in ever decreasing circles. To stretch use a little less steam but more pressure to pull/stretch the fabric. The idea is to shape the fabric pieces in the 3rd dimension but ensure they stay the same overall shape as the original pattern. Essentially you are aiming to stretch the fabric a little over the chest, shoulders and side seams. The shrinking ‘areas’ will compensate for the stretch and keep the pattern shape the same. Give it a go and you will be surprised at the better fit. 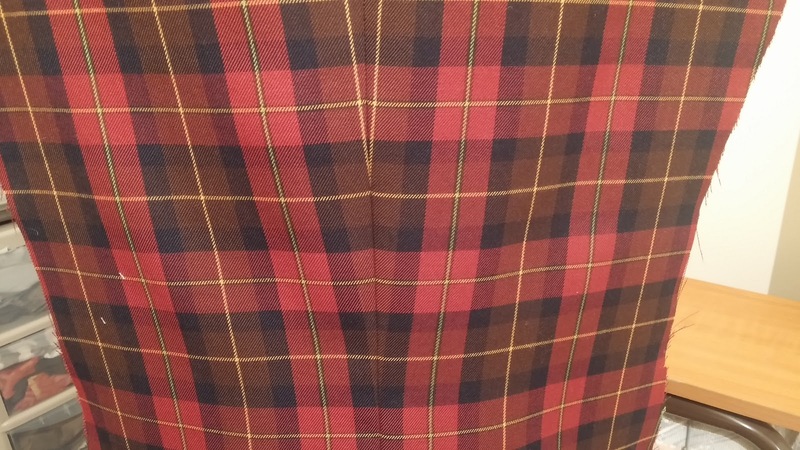 The fronts have a full length dart (From chest to hem) again Baste first to check the pattern lines up before sewing! I added welt pockets as per my tutorial and these were hand-stitched using a full back stitch. This method ensures the stitching is completely hidden in the welt/fabric join. A bias cut pocket flap was also added. (Note I placed the pockets an inch higher than the pattern suggests). I opted for the contrasting bias cut flap as the front dart would make pattern matching nearly impossible! The pattern does not have a chest pocket but I wanted one. Simple: I cut a welt on the bias and added the pocket. (I will write a tutorial on this for my next post). 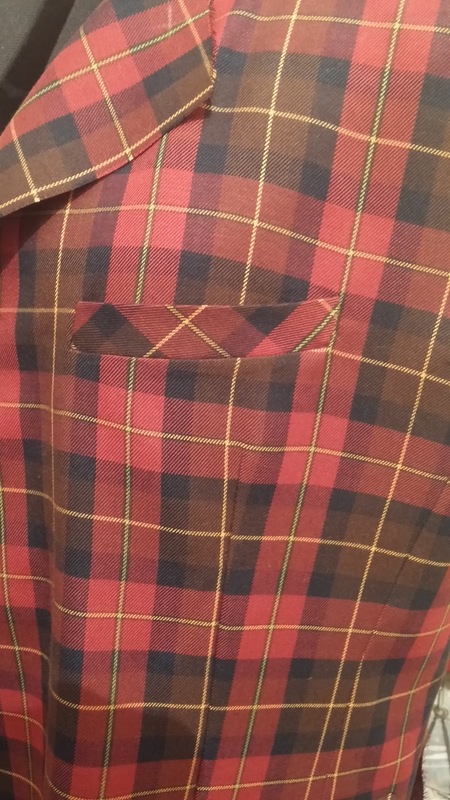 The chest pocket is placed 1.5 inches from the arm seam line and aligned with the front sleeve notch. Again this was all hand sewn except the lining! Next the side panel was sewn to the back and fronts (basted to check pattern match again!) and the shoulder seams sewn. Now the iron-working you did on the shoulder seams means they fit beautifully without having to ‘ease’ the back seam in place. So thats where I am so far. Next will be the canvas interfacing for the fronts and I will introduce you to the wonderful Pad stitch technique! 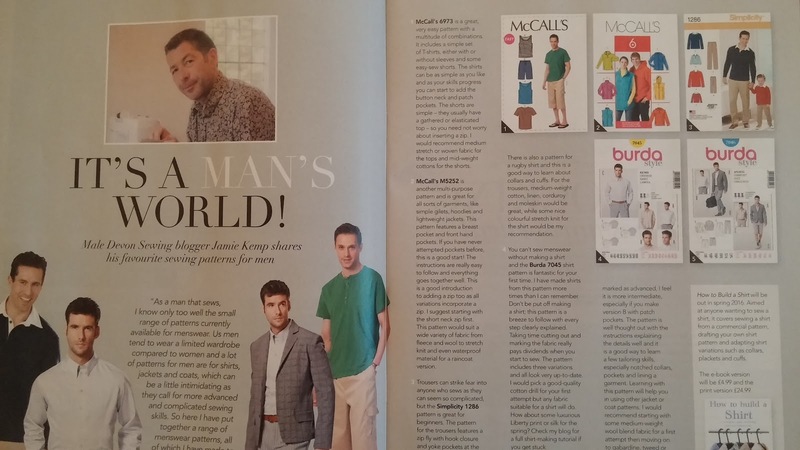 In other news…..January has seen me appear in 2 sewing magazines! Yes at the beginning of the month I had a 2 page spread in ‘Sewing made Simple‘. I was asked to write an article on menswear patterns and have had a lot of positive feedback; hopefully more people will start sewing menswear? 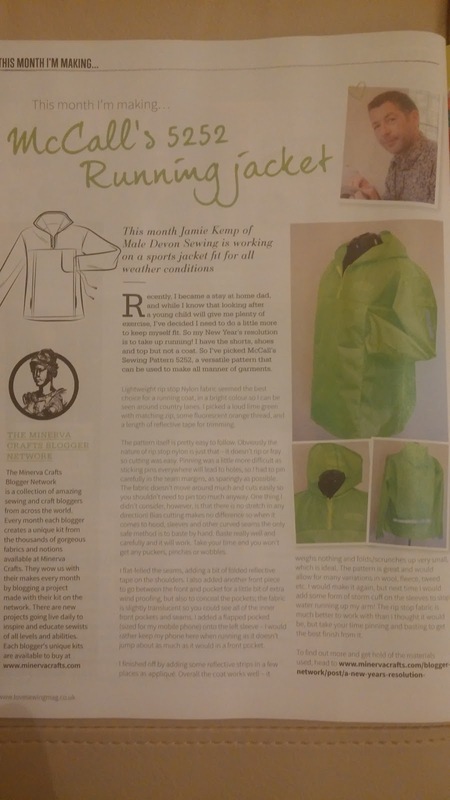 I also appeared in ‘Love Sewing‘ magazine with the running jacket make I made as part of the Minerva Crafts Bloggers network. 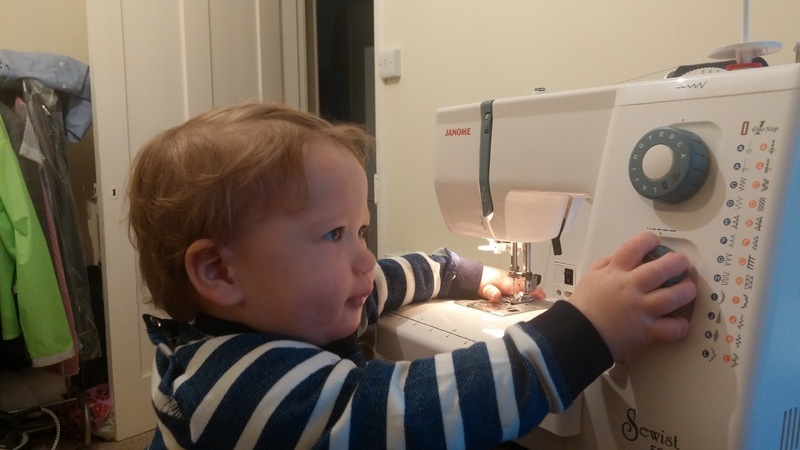 So January is over and it has been pretty busy all round; even Harry, who turned 1 last week, is getting interested in sewing! Thanks for this interesting and informative post! 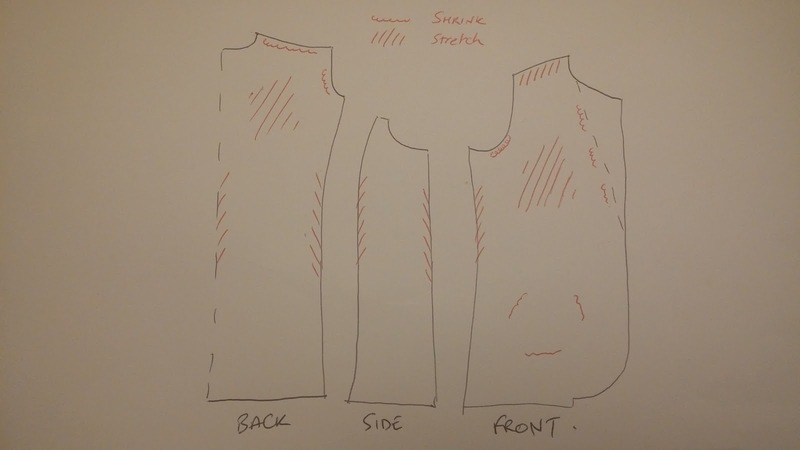 Best explanation of pattern matching that I have read on a blog and when I draft my own (very simple patterns), I will ensure I add my own horizontal line as well as a grain line for pattern matching. I'm really looking forward to reading the next instalment of this tailoring class. I'm impressed you've been featured in magazines and hope you get a lot more. Hello Miss J. Thank you for your lovely comments. What are you making at the min? Fancy joining #Blazerof2016? like this entry. And I am very happy to see another man who is dedicated to sewing menswear. You make nice and fashionable garments. Great!!! Great work, Jamie. I'm in the slow lane and soaking up all these wonderful tips before I start. I especially like the advice to hand sew the pocket welts. Much more control to be had. Will hopefully get off that starting block soon!